This marker, simply put, is amazing. The nib is definitely high quality. I go through sheets and sheets of paper everyday, and the nib has easily withstood 500+tags/throws in my blackbook, and the refillability is definitely a plus. Depending on what type of paper you are using, it is basically a streak free line, and you can bust out the crispiest handstyles with it. ATTENTION TOYS: do not use this for bombing. this is a blackbook/sticker marker. 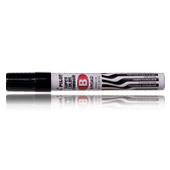 If you want to hit the streets, get the pilot Jumbo Permanent marker, AKA "ol' faithful". Overall, 5/5 would recomend! Cop one now!